There’s plenty of parking on a dirt pad in front of the accessible Melody Cabin, with level access to the front porch. Inside there’s a small kitchen with a stove, refrigerator, sink and microwave, plus a small table for two in the dining area. 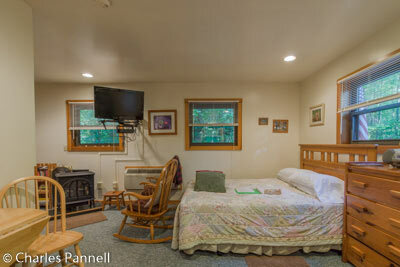 There is good access to one side of the 22-inch high queen-sized bed, and to the two rocking chairs in front of it. The bathroom has a full five-foot turning radius, as well as a 41-inch wide door, so there’s plenty of room for even the largest wheelchair. 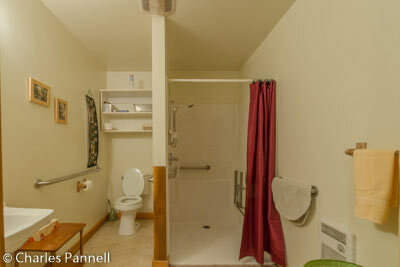 The roll-in shower has grab bars, a hand-held showerhead and a fold-down shower bench. The toilet is in a 30-inch wide alcove, with grab bars on both sides, and there’s also a roll-under sink in the bathroom. There’s level access to the back deck which borders a woodland area; and although you need to be able to walk to access the hot tub, it’s still a very pleasant place to relax. 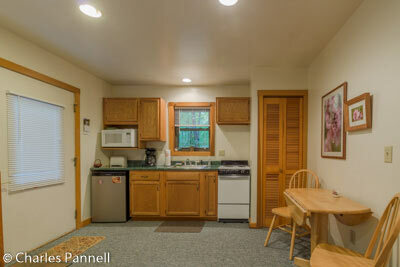 The property is appropriately named, as you can hear the melodic song of the nearby creek wafting through the trees. Additionally, Upton cuts through all those pesky arrival details, as payment is collected in the advance and the key is left under the mat. The only thing you need to do to check-in is unlock the door and enjoy. Upton is available should your require any assistance, but she also understands the importance of privacy. Not only is the Melody Cabin a very accessible and off-the-beaten-path find, but it’s also the perfect place for a romantic retreat. And with rates starting at $125, it’s also very easy on the wallet.